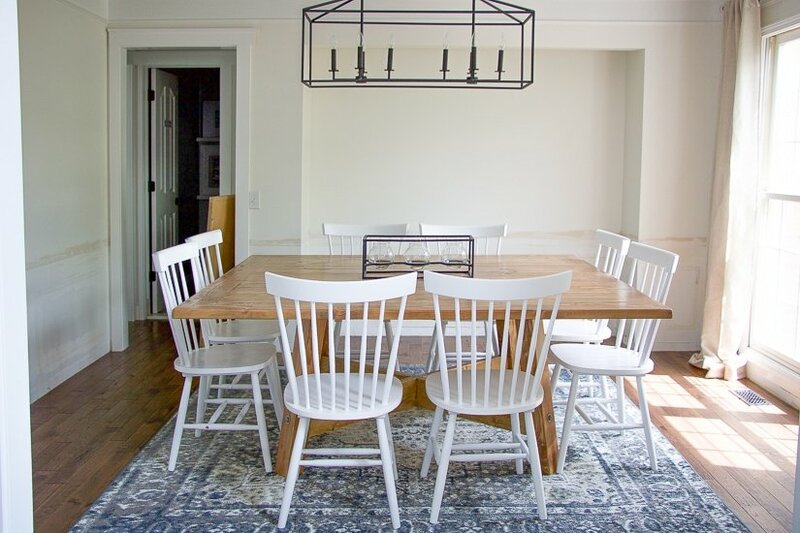 And we’re back with more updates on the dining room! 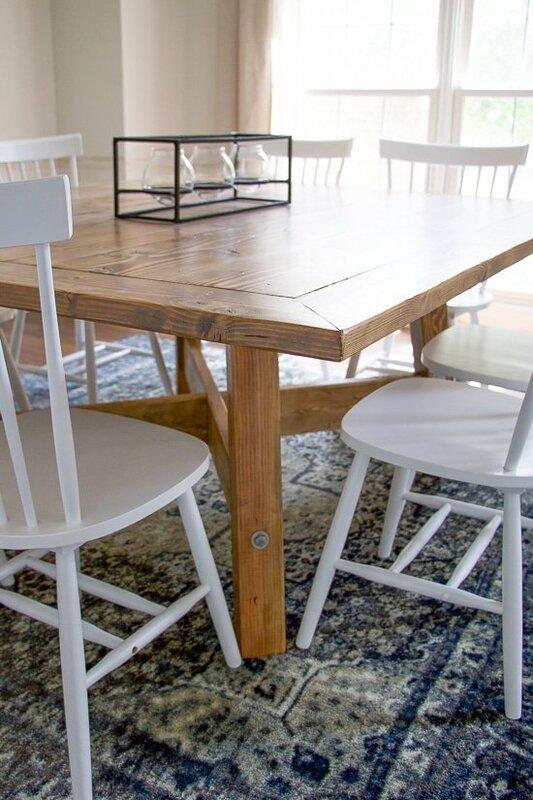 So far we’ve shared how we built our huge square custom farm table to fit the share of the room perfectly (at least perfectly for us! ), and now we’re tackling the harder job – removing the old picture frame wainscoting from the walls. Whyyyy did we decide to do this? 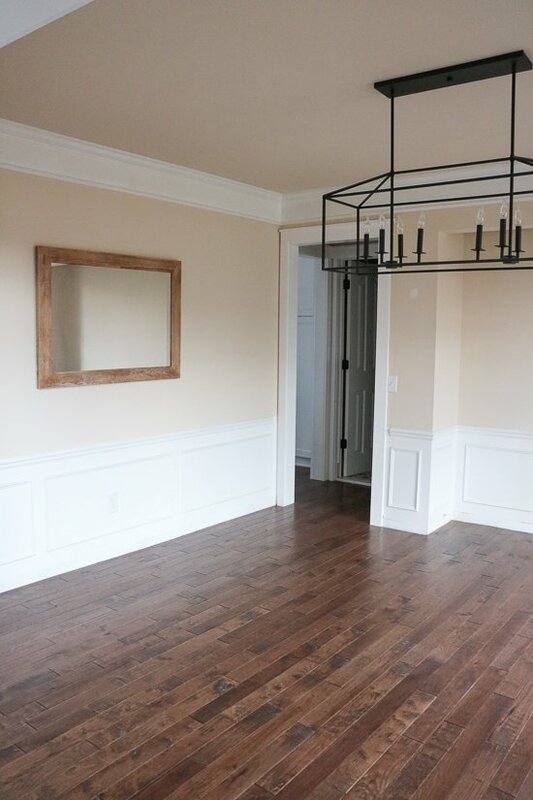 I know that picture frame moulding is actually starting to make a comeback, especially in a more custom and fun way, but the wainscoting that we had in our home was unfortunately un-savable after a few updates we had done. First update was the trim work. 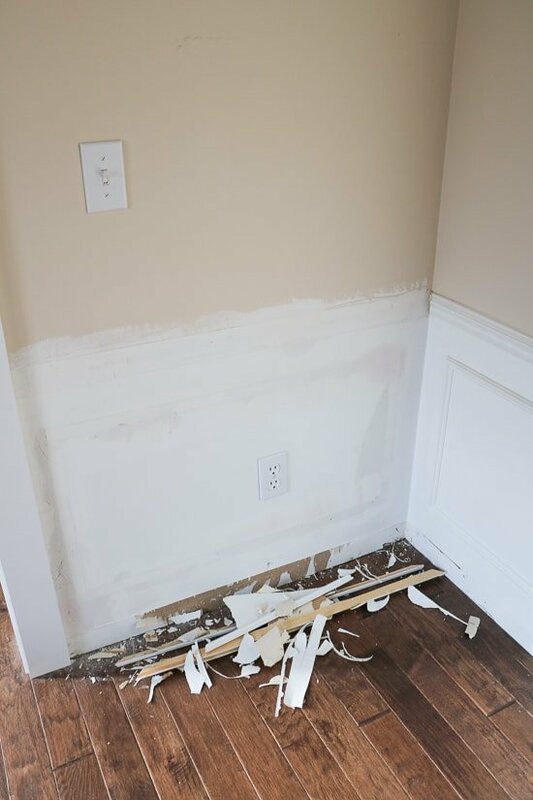 In order to put in all of the new door casings we had to cut back the chair rail and unfortunately we didn’t measure correctly, so they didn’t line up correctly and there was a huge gap. 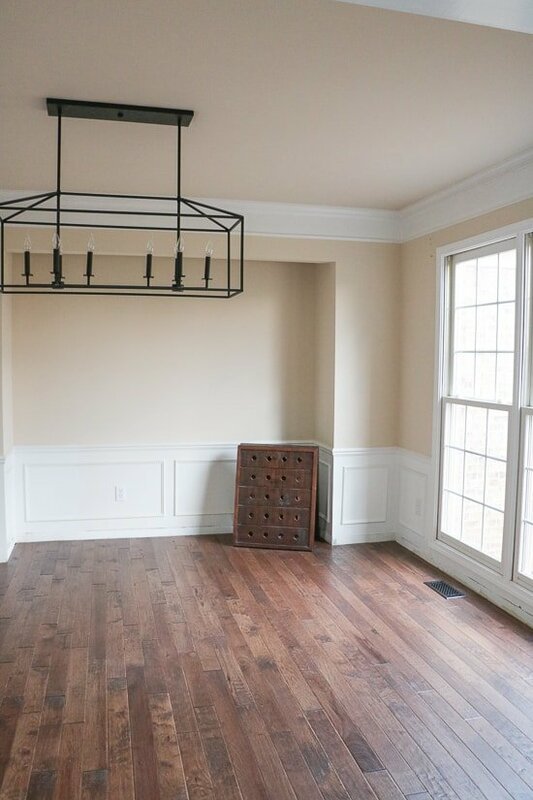 The second update was the flooring – previously in this room there was carpet and basic baseboards. When we had our hardwoods installed, we removed both and opted to reinstall 1×5 boards as our baseboard throughout the whole house, meaning the top of the new baseboard was going to be higher and the picture frame moulding would no longer be centered between the baseboard and the chair rail. Turns out, I am a bit neurotic on anything that’s not symmetrical, so it had to go. The main goal during demo was to do the least damage as possible to the walls. 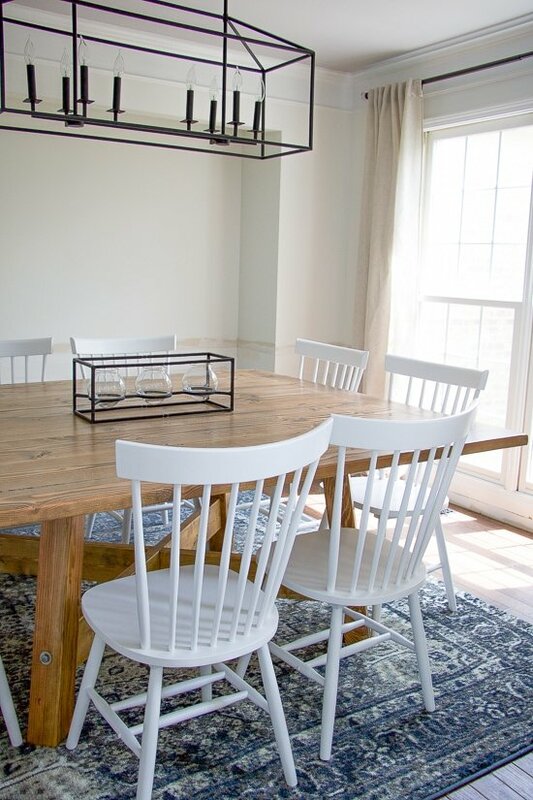 We carefully scored all of the trim work with a knife, and then used a small pry bar and hammer, working all the way down each piece to gently remove it. The next part is the easiest, but most challenging part at the same time. There’s a lot of scraping and sanding of the walls to get any extra paint build up or caulk removed, and then layers and layers of mudding. 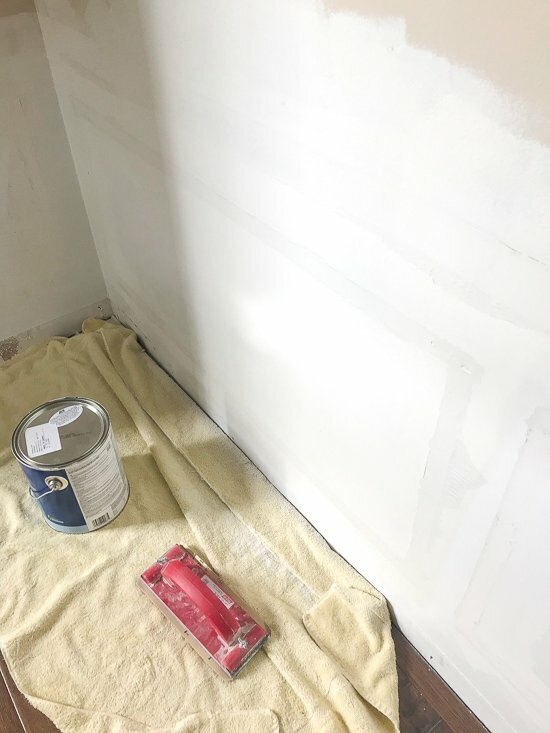 We used both drywall mud and a large pail of spackle to try out both products, and if you have the time to wait for it to fully dry, I’d recommend the drywall mud. 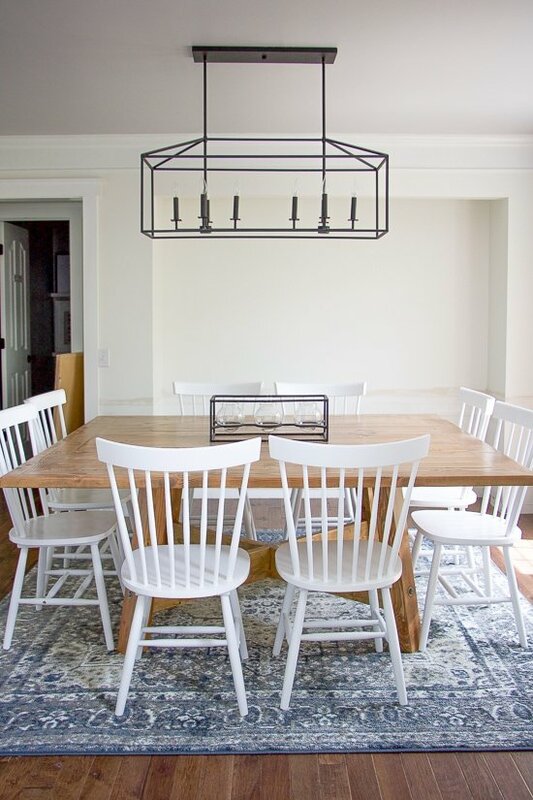 Once everything was sanded down, we decided to put a simple 1×4 chair rail back up before painting everything to give the room at least a little character but blend with the new simpler trim and casings throughout the house. 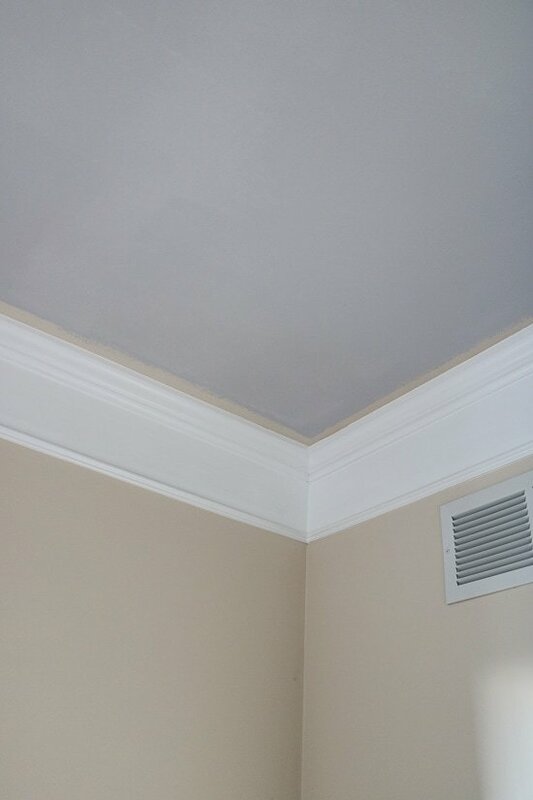 The color we chose for this room was White Dove by Benjamin Moore and we offset all of the white by adding a pop of color on the ceiling. 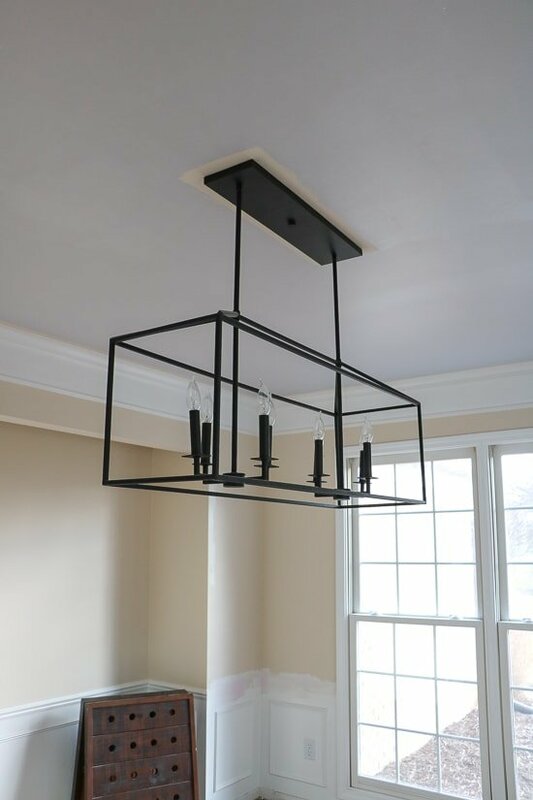 I had leftover paint from the half bath project, so we used that (Cement Gray by BM) to add a little dimension. Next up was the fun part! Shopping! 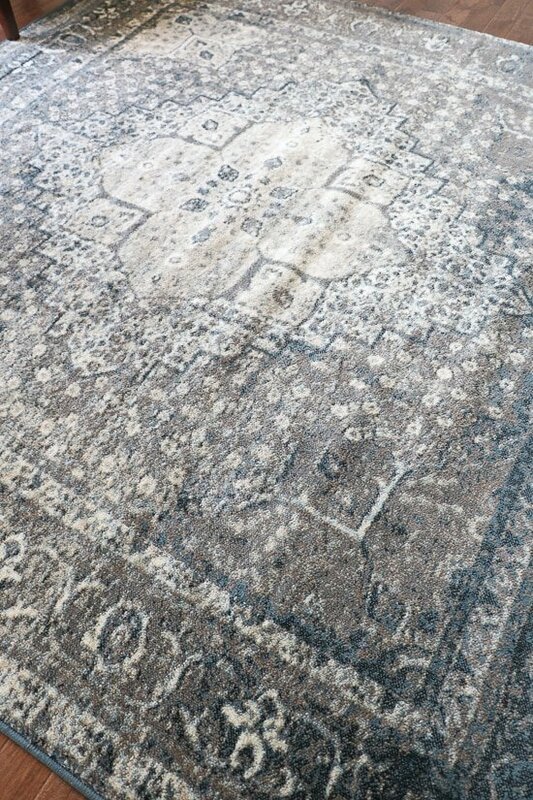 I fell in love with this rug from Rugs USA, and picked it up in the 8×8 square size. 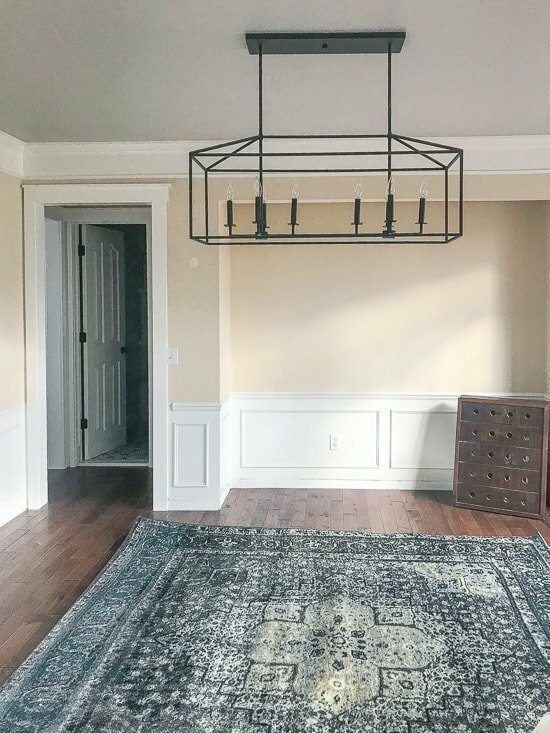 Even before we had finished all of the trim work (which I sectioned off into multiple days (aka weeks) because it was a lot of work while taking care of a newborn and getting approximately 2.5 hours of sleep a night) we got some glimpses of how everything was coming together! 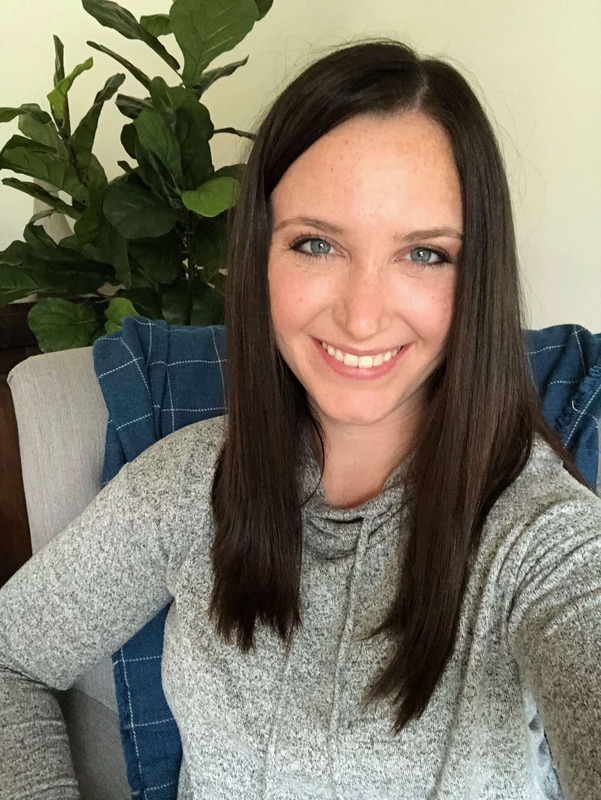 I LOVE the results of it being gone, but the procrastination game was strong with this one. 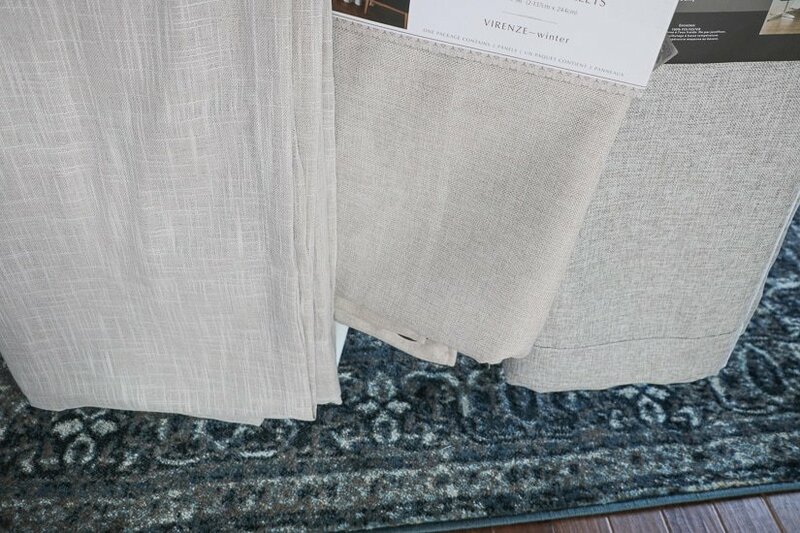 Next up was curtains, if you’re still following along with this back and forth post 🙂 I knew I wanted a tan curtain with a little heavier weave for some texture, and brought home every option I could find at Homegoods. In the end, the winner was the middle! I liked how it brought some warmth into the room and picked up some of the beige tones in the rug. Progress! 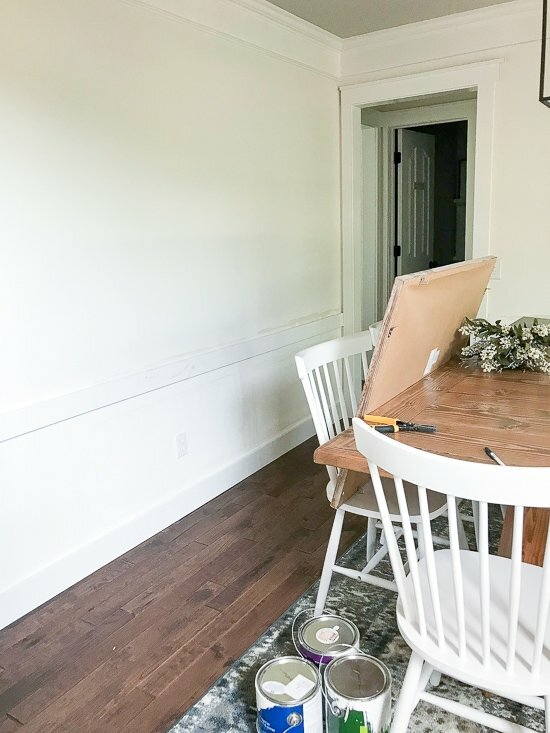 In the end, removing the old picture wainscoting was a pretty big project to do it right and as a DIY, but was totally doable with a little patience and a lot of arm sanding workouts sessions. Every time we sanded we’d take a step back, fill any holes or unevenness we could see, and kept the process going until the wall was smooth. It’s definitely trial and error, but with a little patience you’ll never even know there was trim there once!